Beginning shortly after the end of the Spring Quarter, workers will replace the current stone paths with more even walkways whose pavers capture the historic feel of the quads while improving access for people with disabilities. While construction is under way, users of the Main Quadrangles will have to use alternative routes to some buildings and passageways. Trustees also reviewed a plan last week that would take advantage of that construction window to transform the main drive within the quadrangle, from the circle to University Avenue, into a pedestrian walkway. “The iconic image of the University of Chicago is its Collegiate Gothic Main Quadrangles and the Botanical Garden they enclose. Now we’ll be able to create the kind of pedestrian environment for students, faculty, staff and visitors worthy of the heart of our campus,” said Steve Wiesenthal, Associate Vice-President of Facilities Services. Representatives of University Facilities Services are meeting with stakeholders in the buildings around the Main Quadrangles to find out how best to accommodate their needs while eliminating most daytime vehicle access. Wiesenthal said that early in the fall, administrators will hold an open meeting to further explain possible policy changes and answer questions. 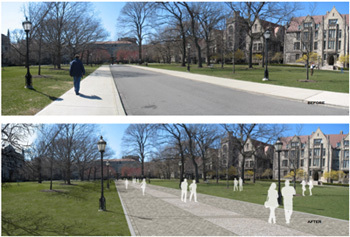 A project that begins this summer will replace quadrangle streets and sidewalks with pedestrian-friendly walkways. The work will be done by September. Work is scheduled to begin Monday, June 15, and the construction will necessitate changes in routines this summer for some people who use the quadrangles to enter buildings for work and classes. “Essentially what will happen is that people who enter some buildings now on the quadrangles may need to enter from adjacent streets—Ellis and University avenues, and 57th and 59th streets,” said Boyd Black, Assistant Vice President of Capital Project Delivery in Facilities Services. Signs will help direct people to entrances and also point out ways to access interior buildings such as Swift Hall. During the summer, parking will be restricted in the Main Quadrangles, and access by most vehicles also restricted. People also can expect noise and dust from the construction, which will take place from 6 a.m. to 8 p.m. on Monday through Saturday. Black explained that undertaking both projects during the summer will reduce both the disruption and the total cost. When the project is completed in September, the main entrance to the quadrangle and the circle drive will still be accessible to emergency vehicles and some off-hours deliveries. Details of the policies surrounding vehicle use on the quads are still being worked out. Improving access to the quadrangles for people with disabilities is an important part of the transformation. The University will replace about half of the paver and concrete pathways in the main quadrangle. The work is part of an ongoing effort to enhance campus accessibility, for which funding was previously set aside. In addition to the re-paving work, a number of other projects will be under way on or near the Main Quad this summer. Excavation for construction of the Mansueto Library will get under way. The Math Stat building will soon undergo a complete interior and exterior renovation; there will be repair work on the Jones building façade; a new accessible ramp will be installed at the east entrance of Harper Library; and Gates-Blake halls will benefit from interior plumbing replacements. The Joseph Regenstein Library chilled water loop will be connected to Pick Hall, and the Social Sciences research building portico will be restored. More information on the quadrangle project as well as other projects may be found at http://facilities.uchicago.edu/campusconstruction/index.html. 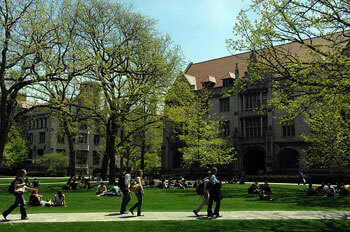 Quadrangle users with specific questions about access can direct them to summer-quad-construction@lists.uchicago.edu.